Sometimes a driving experience comes along that is so spectacular it shakes the tectonic plates of the motoring world. 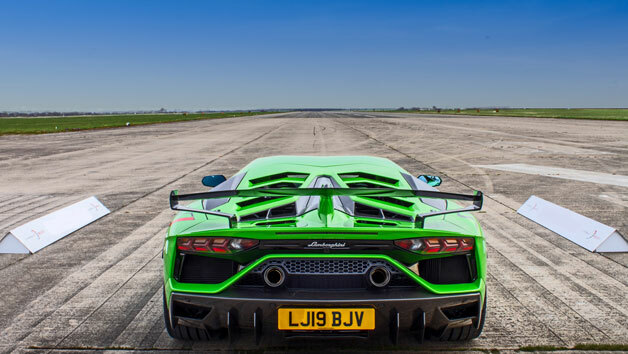 Now's the chance to join a select group of privileged drivers and take two elite supercars to the 200mph mark on a private two-mile runway. Warm-up with drives to circa 180mph in a Ferrari 488 Spider and Aston Martin DB11, and then attempt to break the magic 200mph mark in a Lamborghini Aventador S and McLaren 720S! With a professional instructor in the passenger seat, budding racers benefit from one-to-one guidance and track tips. In-car video footage is also provided from each supercar, so participants can relive the mind-bending speeds again and again. It's time to put the pedal to the metal! Minimum age is 21, max age 70. Maximum weight is 17 stone. Minimum height is 5'4'', maximum 6'0''. A full British or international driving licence must be produced on the day in order to participate.